The most difficult aspect of my business has been learning how to take good product photos. Make that GREAT product photos. And I still haven’t achieved it but I’m working on it. Here I’ll share with you what I’ve learned. You really can’t take great photographs without having a macro lens, that is, a lens that allows you to get up close and personal to your subject. I use a Sony and it works perfectly well for my needs. Set your camera to the highest number of pixels possible and take some time to understand the white balance setting for best results. Go outside!!!! This has been the most useful tip I found. Wait for an overcast day and take your items outside to photograph them. A bright sunny day will cast hard shadows which does not look good but a day with some cloud coverage will give a soft look to your pictures. If you can’t get outside, try to set up a photography station near a window. Match your background to your item. 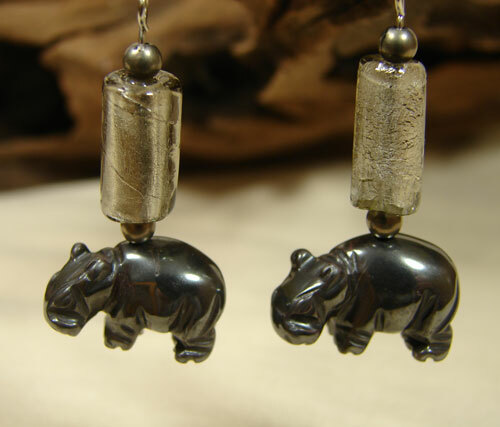 If you make rustic, nature-inspired jewelry, choose a rock or a piece of burlap cloth as a background. Do not choose a slick, modern background. Make sure the background isn’t too distracting. You don’t want your customers looking at the piece of driftwood you placed your necklace on instead of the necklace itself. 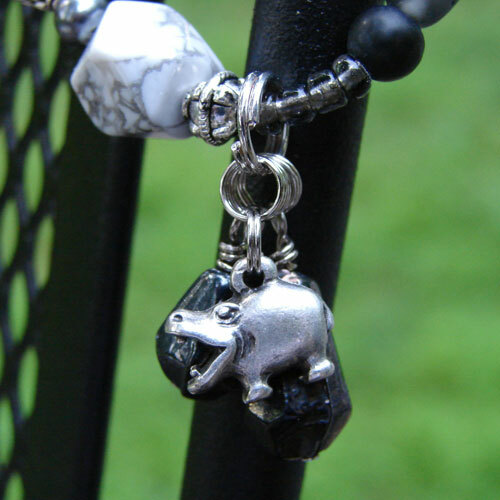 In the photo above, I’ve hung my hippo necklace from a chair outside. At first I loved the contrast between the bright green grass and the gray, silver and white necklace but later I decided that it didn’t really work too well so I tried again. Plus you don’t get a good sense of the dangles in this photograph. Here’s my final image. 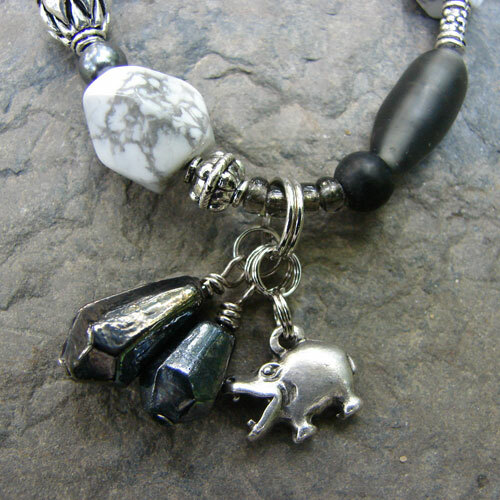 I’ve found a beautiful gray stone that complements the beads in my necklace and I’ve spread out the dangles so you can see them clearly. This necklace sold very quickly. In the photos below I’ll show you how I moved from laying my earrings on a flat piece of fabric, which did not look at all good, to hanging them from a piece of wood. Here I’ve arranged the earrings on a place mat, thinking that the black would show up well against the beige fabric. 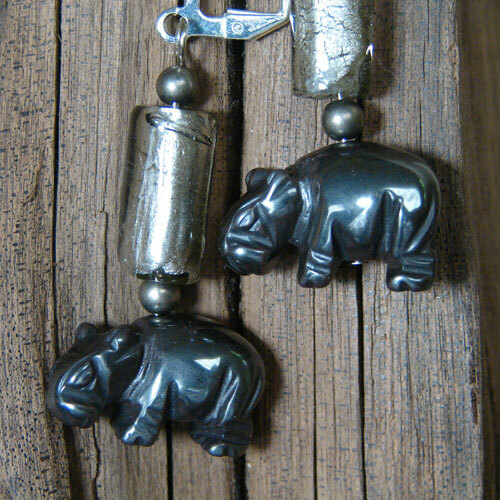 But the black hippo beads are hard to see and the camera is zoomed out too far to capture any detail. In the photo above I’ve tried to zoom in more but I still can’t really see the black hippos very well and they look out of focus. I decide I am not happy with us and try something else. Now the earrings are looking better. The are hanging from a piece of driftwood and the black beads are showing more detail. The background is slightly out of focus, which puts the emphasis on the earrings. But the hippo on the right has his head turned a little and it looks strange. 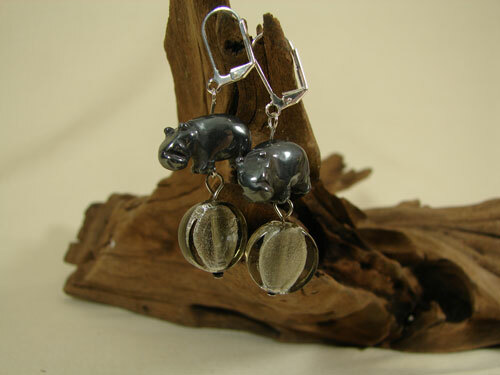 Above is a pretty good photo of my hippo earrings. The hippos are both facing the same way and the photo is in focus and well lit. But the hippos look a tad jammed up. I try to separate them but there are no protrusions in the wood from which to hang the jewelry so I just crop the photo and go with it. Later I photograph a similar pair of earrings. In the photo above, I’ve successfully separated the earrings so they have some breathing room, but I’m not happy with this photo. The camera angle is looking down on the earrings and it’s just not a flattering view. I try again. Success! I love this picture! I’ve placed the earrings ON the driftwood instead of hanging them from it and it looks great. 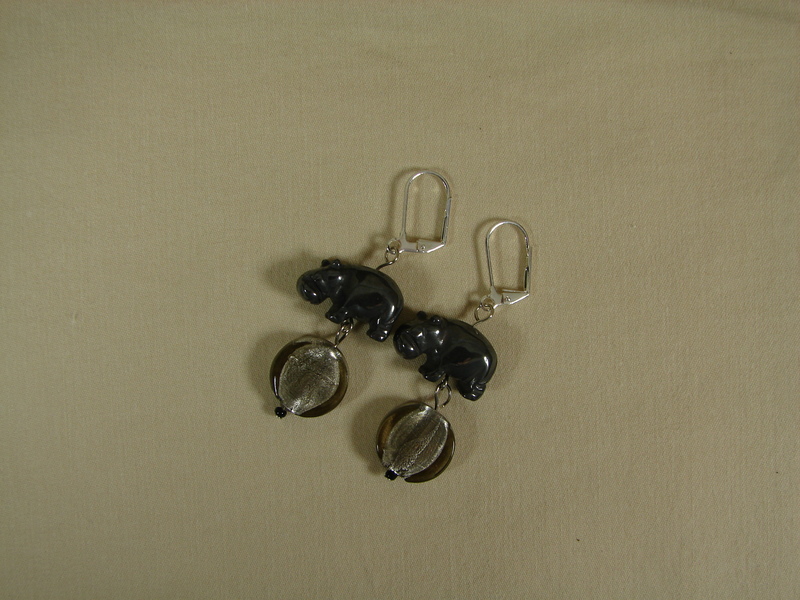 I love the contrast between the materials of the silvered wood and the gunmetal gray hematite earrings and foiled glass beads. 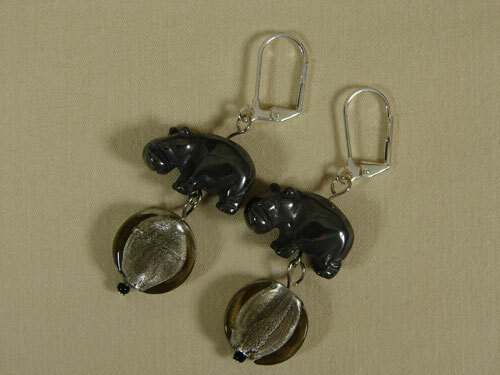 The earrings are in focus and there is lots of detail to be seen in the hippo beads. This photo is a keeper. Move your products around and try different angles and props and backgrounds. Keep at it until you have something you like. Or at least something you can live with.